Weave Magazine: Call for Book Reviews! We’re opening submissions for book reviews! Then let us know! Please submit reviews to Weave by using our submissions manager. Emailed submissions will be ignored. If you are having trouble submitting, please contact Submittable support. Please limit reviews to 500-800 words. 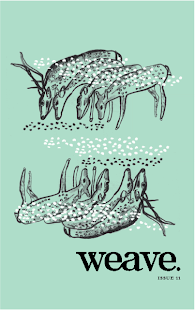 We accept multiple submissions for chapbooks only for our Chapbook Roundup. Acceptable categories include all genres of fiction, poetry, chapbooks, and creative nonfiction. Please ensure that your selection follows Weave Magazine’s themes of diversity, community, and equality. And, of course, if you’re an established reviewer and would like to join our reviews team, please contact our reviews editor, Nicole Bartley. Please include your name, contact information, a brief bio of yourself and your work, your estimated turnaround time for reading and writing reviews, 1-2 titles of work you’d like to review next, and a few samples. Jan Priddy reads her poem "Zoöpraxiscope"
Announcing Weave's September Subscription Drive!